2018 Artist Support Grant Recipient, Amanda Smith's work moves seamlessly between mediums, evading easy categorization and disrupting notions of what characterizes contemporary painting. 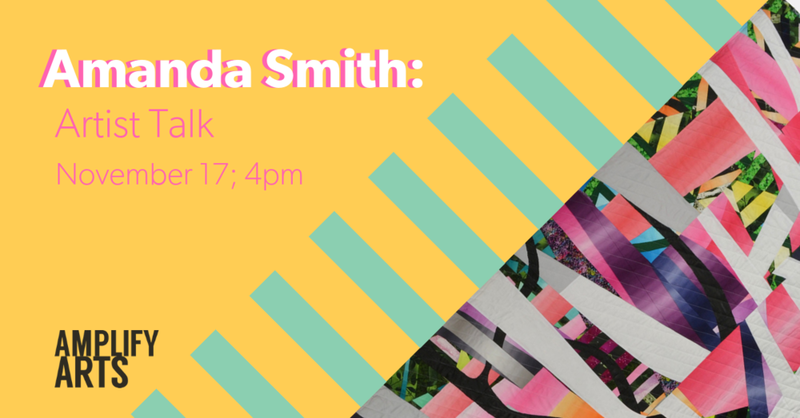 Join Amanda as she presents her work and discusses the evolution of her practice, her relationship to materials, and the many forms a "painting" can take. Space is limited; please RSVP. Amanda earned her MFA from the University of Nebraska-Lincoln, and her BA from The University of Puget Sound in Tacoma, WA. She has exhibited nationally and internationally, including SPRING/BREAK Art Show in NY, Rochester Art Center in MN, Leedy Voulkos Art Center in Kansas City, Biblioteca Viva Egaña in Santiago, Chile, Rosemary Duffy Larson Gallery at Broward College in FL, and Box 13 Art Space in Houston. She was a visiting artist at Temple University Rome, Italy, and was awarded residencies at Fljótstunga in Iceland, the Kimmel Harding Nelson Center in Nebraska City, and Art 342 in Fort Collins, CO. Smith taught painting as an Assistant Professor at Indiana University, Minnesota State University, Mankato, and Doane University. You can learn more about Amanda and her work at www.amandasmithart.com.